Seattle and Washington state are fighting each other in court in an attempt to limit their respective liability for their years of dithering over who should fix the safety of the Aurora Bridge. 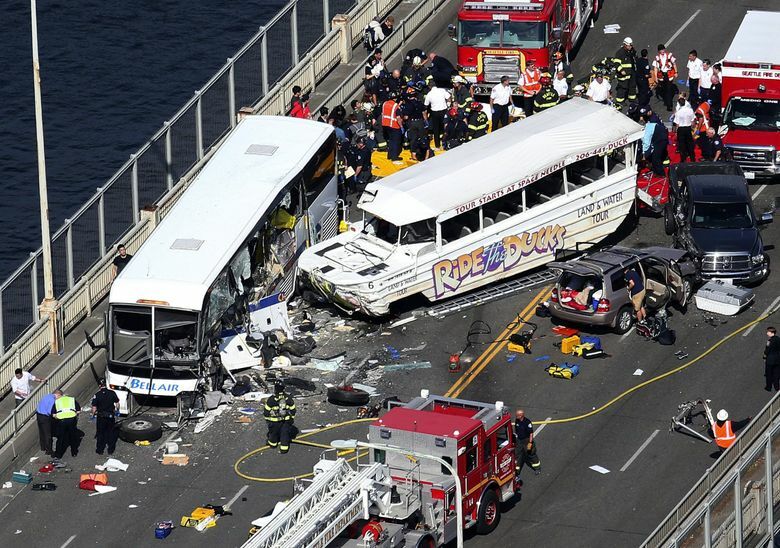 Remember the horrific crash on the Aurora Bridge? The one where the Ride the Ducks amphibious truck carrying tourists careened across the bridge and smashed into a charter bus? The collision killed five college students and injured some 70 others. It’s hard to forget the loss of innocent life, or the brutal maiming caused by such a gruesome accident. And yet today, almost three years later, little has changed. In fact, on June 1, near the area of the Duck-boat accident, five drivers crashed, sending two cars across the centerline. All survived, even though firefighters cut one man from the mangled wreckage. The evening rush hour that day suddenly became an hourslong marathon. Buses were detoured and riders, including me, got out to walk home, rent a bike or find another way out. You might think in the months following the Duck-boat disaster that city and state leaders would finally have agreed to fund a center barrier on the bridge to better protect the 70,000 vehicles that cross the 87-year-old span every day. Nor is there movement to fix the bridge’s notoriously skinny lanes that are so narrow some Metro buses straddle two at a time. I know because I ride the bridge daily. For drivers, it’s a white-knuckle event. The smart ones move out of the two center lanes, hoping it will not be the day when an oncoming driver loses control at 40 or 50 mph. After initially vowing to work together following the Duck-boat crash, here’s what I can tell you about the city and state today: They’re now fighting one another in court over who is responsible for safety improvements. That’s right, our two governments are in a finger-pointing duel, lobbing legal briefs in an attempt to paint the other as the responsible party for failing to add a center divider across the 2,900-foot steel bridge. Think about that. Instead of following through with safety changes after the Duck-boat accident or other accidents — remember the Metro bus that plunged off the bridge in 1998 after the driver was shot? — the state and city are hammering each other in court. And how does this help public safety? Between 1998 and 2015, there were some 79 injury accidents on the bridge. From 2013 to 2015 alone, 15 crashes were reported due to a vehicle crossing the centerline of the bridge, according to one legal brief. What the city and state are really trying to do is limit their respective liability when the bill comes due for decades of shared neglect. And it will come due. A chunk of the litigation on the Duck-boat crash is headed for trial this fall, and yes, the owner of the Duck boat, which suffered a mechanical failure, is liable. But who has the deeper pockets? The awful truth is this dithering is decades old. In 2003, the state and city issued an omnibus report on Seattle’s Aurora Avenue North, calling it “one of the more accident-prone roadways” in the region. It included safety options, even suggesting it could suspend pedestrian walkways below deck to allow for wider lanes and a center median. Cost: $29 million. The crazy-making irony is that the city and state have money and technical know-how to bring the bridge into the modern era. They simply chose not to, even though the Federal Highway Administration found the span to be “functionally obsolete” in 2007. Remember that in 2015 Seattle passed its $930-million transportation levy. The same year the Legislature passed a $16 billion gas-tax transportation package. Neither had a nickel for a center divider. If you call the state Department of Transportation, as I tried to do, and ask about the bridge, a well-prepped spokesman will suggest you need to talk to the city. When I called the Seattle City Attorney the answer was eerily similar: Talk to the state. I guess when you run out of excuses, it’s best to hide behind your litigation. Seattle and the state did agree on bridge maintenance — in 1954. More than a half-century later, with that agreement still in effect at the time of the Duck-boat accident, attorneys are still parsing what it really means. The state calls the bridge a city street that is part of a state highway. “If a jury determines a center median barrier should have been placed on that bridge, the City was under a legal obligation to do so,” the state argued in its May 4 brief to King County Superior Court Judge Catherine Shaffer. In a better world, Seattle and the state would have fixed the bridge years ago, sharing the cost and maybe saving lives. And in this imagined place, we would have had at least one elected official with the chutzpah to stand up and say, enough!